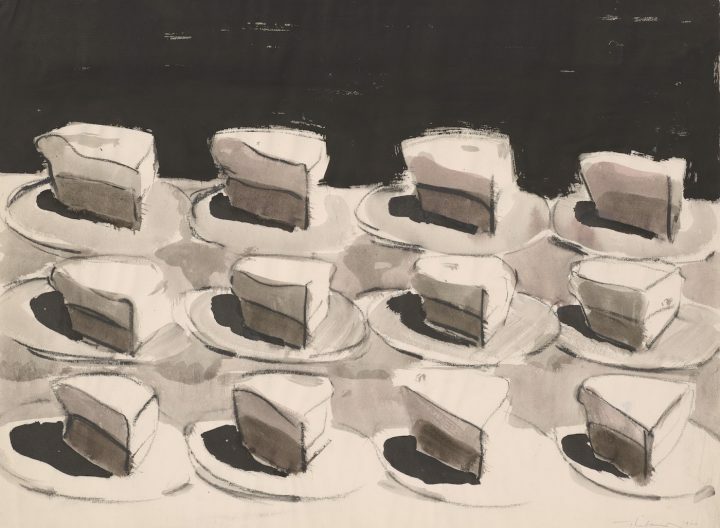 Thiebaud, just a few months shy of his 98th birthday, offers a glimpse into the thinking behind his five decades of work. I was surprised to learn that the exhibition Wayne Thiebaud, Draftsman at The Morgan Library & Museum (May 18 – September 23, 2018), curated by Isabelle Delvaux, is the first time an institution has examined the full range of this well-known artist’s works on paper — from early cartoons dating from the 1940s to quickly done notebook sketches to his sophisticated use of graphite, watercolor, pastel, and charcoal. After all, Thiebaud is just a few months shy of his ninety-eighth birthday and has been showing regularly since 1962. I suppose part of this has to do with the fact that many of the works in this exhibition are studies rather than final products and weren’t made with an exhibition in mind. I am thinking specifically of the pages from notebooks and the drawings done after another artist’s work. 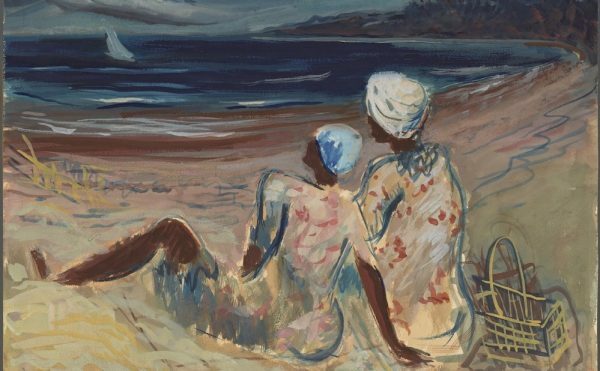 But that is precisely why they are interesting, as they offer viewers another glimpse into this beloved artist’s work. 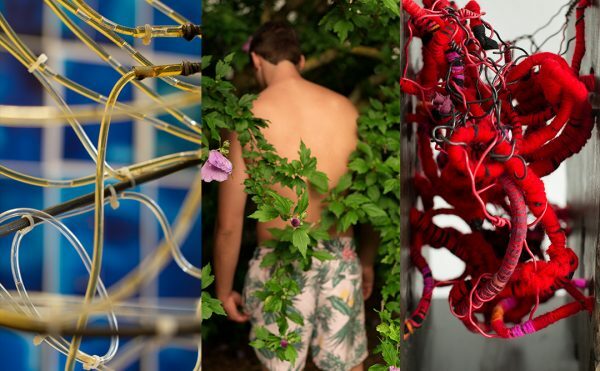 We don’t just want to see the art: we also want to learn how an artist thinks. I have written on Thiebaud’s work many times, most recently for the catalog California Landscapes: Richard Diebenkorn | Wayne Thiebaud published for the exhibition at Acquavella (February 1 – March 16, 2018). No matter how many times I have seen his work, there has always been something that surprised me. This often happens with the best artists. I teach by example. I try not to make it my way but, in the old academic sense, to try to inquire after those things which become basic tools in drawing. Those tools are specified by what is needed to make a three-dimensional world on a two-dimensional surface. Basically, that primary process, if we face it correctly, can be like a study of any other academic subject. Thiebaud sees drawing as a skill that can be taught and learned, like physics or calculus. Rather than rote learning, the student must ask questions. This continual inquiry is also central to Thiebaud’s entire career. For him, drawing is practice, study, notes, and discovery. It is a way to improve, keep sharp, as well as test oneself, especially against those who preceded you. For Thiebaud, drawing seems to be something that he knows he will never fully master enough to be satisfied. The exhibition includes two works done in graphite after different artists for whom drawing was central: Honoré Daumier and Giorgio Morandi. Done in the 1970s, by which time Thiebaud was a well-established, critically acclaimed, artist, these drawings show a side of him that is almost unknown; his willingness to make work after another artist, which was once a common practice for young artists. Placed next to each other in the exhibition, “Untitled (After Morandi)” (1979) and “Untitled (After Daumier” (1975) reveal Thiebaud attempting to echo their lines’ weight while attaining the fluidity that distinguishes their work. Thiebaud doesn’t copy the image; he inhabits the thing, which happens to be a Morandi still-life and a Daumier sketch of two men, their upper halves, looking to the left. In the Morandi, the line is thin and delicate, as it moves slowly and, at times, hesitantly across the paper, while in the Daumier it is heavy and quick. Daumier’s drawing was done in pen and ink, gray wash and charcoal. 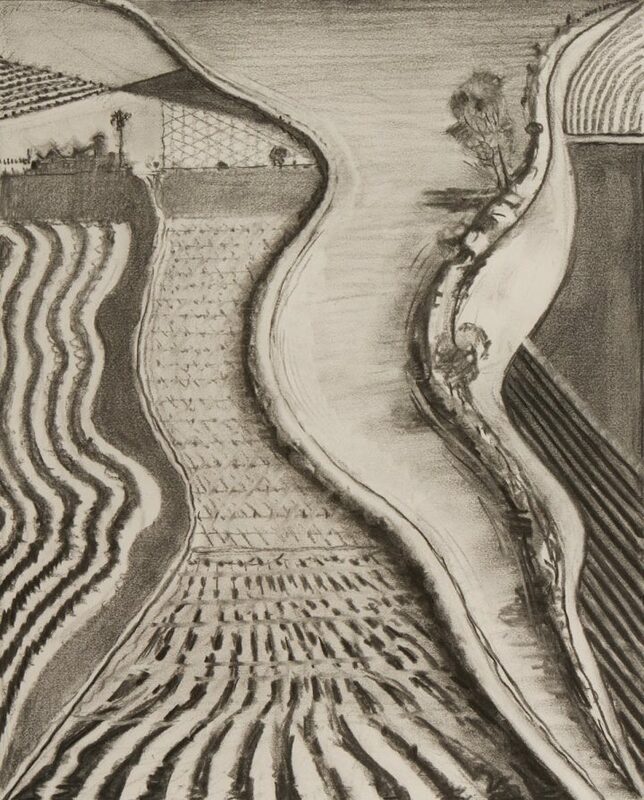 Thiebaud limits himself to graphite, and tries to attain the same effects. Since we don’t have the originals for comparison, I advise that you look at the differences in the weight of the line in each drawing, and how quickly or slowly it seems to move across the paper, and you might gain a greater admiration for Thiebaud. I certainly did. 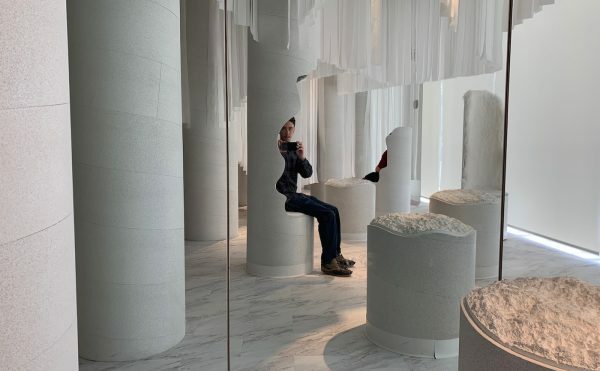 You get the feeling that he was never interested in style, and that art for him has been a lifelong pursuit of knowledge. I imagine that Thiebaud has many more works like these in his studio, all done after different artists. In fact, I know of one instance in which he made such a copy in painting. How marvelous it would be to have an exhibition of the works he did after other artists. 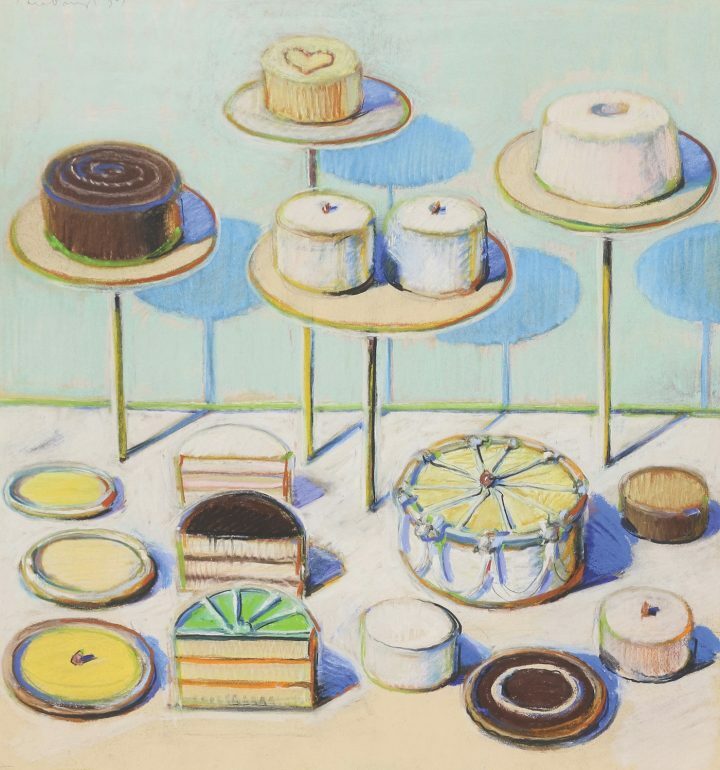 Given the role copying has played in the art of Sherrie Levine and Mike Bidlo, would their champions also argue for these works in Thiebaud’s oeuvre? For about fifteen years, [Thiebaud] earned his living as a cartoonist, designer, illustrator, sign painter, and advertising art director. [Thiebaud’s] pictures look real, not because they are realistic but because they match everyone’s conception of the perfect hamburger or ice cream cone – a conception largely formed through visual advertising. Thiebaud seems possessed by a voracious, joyful appetite. In the works done between 1949 and 1960, his different approaches to drawing recall the angularities of Yasuo Kuniyoshi and the rhythmic packing together of marks found in Philip Guston. 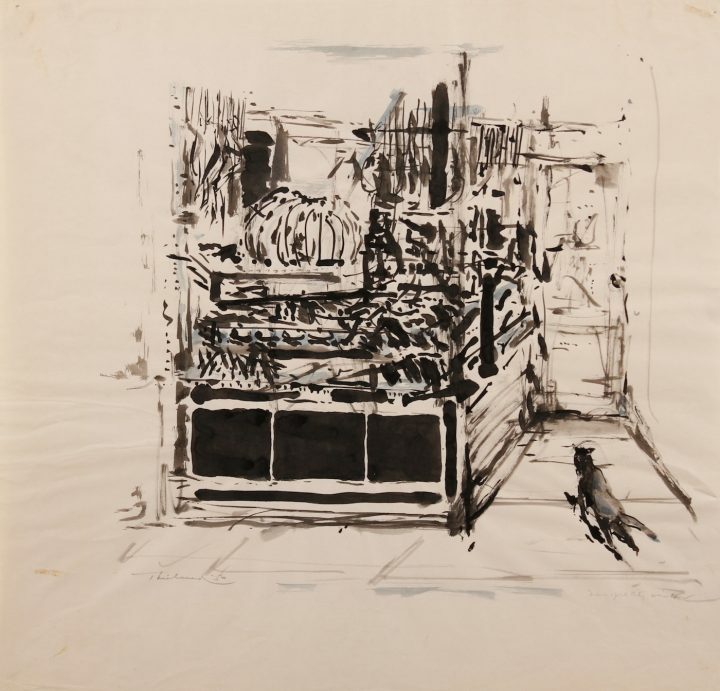 By the time Thiebaud does “Shelf of Pies” (1960), he has pared down his drawing to a series of necessities. The slice of meringue is a three-dimensional triangle divided horizontally into light and dark halves. There are three rows of four slices filling the lower two-thirds of the composition, topped by a black background. The slices sit on elliptical plates, which rest on a tilted plane. This is Cubism 101 meeting all-over painting and the grid. It is brilliant and straightforward, at once realistic and dream-like. Whether the subject is a jelly apple, a cupcake, or a cake, the forms are basic (cylinders, cones, and sections of a cube). Working with different materials on recurrent motifs, Thiebaud discovers the various effects he can produce, as well as what each material (watercolor, pastel) is capable of achieving in terms of density or luminosity. It is hard not to be uplifted by the sheer delight Thiebaud communicates through these homely subjects, about which he feels so strongly. The other revelation lies in Thiebaud’s sketches. They tell us that he seems to be drawing all the time: he is a full-time student and observer. 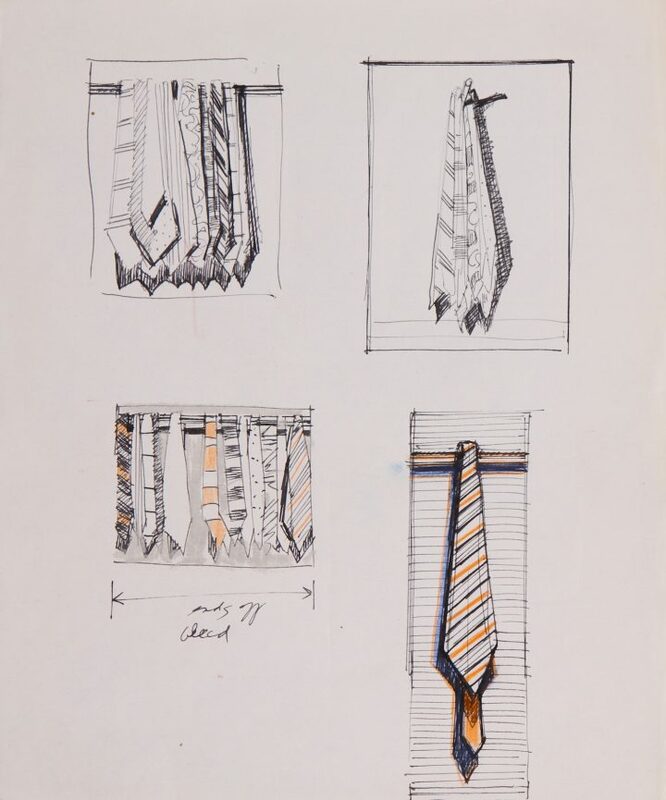 The exhibition includes pages of sketches that have never been exhibited before. Thiebaud uses a layout commonly found in commercial art, marked-off rectangles that he fills with sketches. I suspect he is looking for a subject or motif that he can return to in a painting. He makes 11 sketches in “Page of Sketches with Paint Cans” (ca. 1990), using pen and black and red ink. The 11 sketches are divided into three rows. A linear rectangle frames 10 of the 11 sketches. Most of the sketches are of paint cans but in the middle the artist switches his focus to lipstick. Looking at the sketches brought to mind the stirrings of another exhibition, one that would track the different routes one of his sketches might have inspired him to take. Thiebaud can go from crisp realist images to what I see as homemade Impressionism. He can make delicate pencil lines and thick black marks. 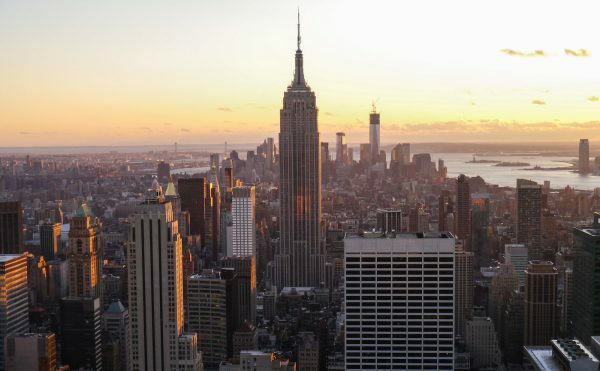 His invented cityscapes are one of his greatest achievements, as are his invented landscapes. The feeling of delight and fantasy running through this exhibition is completely Thiebaud. Wayne Thiebaud, Draftsman continues at The Morgan Library & Museum (225 Madison Avenue, Midtown East, Manhattan) through September 23.